While CBT is considered efficacious for a range of mental health conditions, identifying pre-treatment predictors of differential response to CBT is an important direction for research. This study investigated whether pre-treatment attitudes aligned with cognitive behaviour therapy (CBT) (termed CBT-mindedness) predicts CBT outcome within a clinical sample of adults diagnosed with social phobia (N = 50). 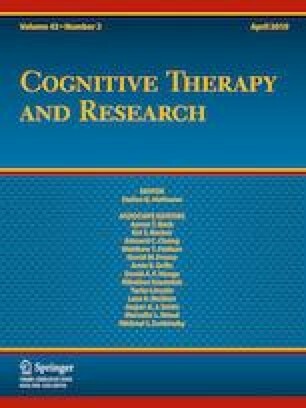 Pre-treatment CBT-mindedness, measured by the CBT Suitability Scale, was found to predict treatment outcome immediately and 3 months following treatment. Higher CBT-mindedness was associated with lower clinician-rated diagnostic severity and client self-reported social anxiety symptoms following CBT. CBT-mindedness predicted self-reported, but not clinician-reported severity, even when controlling for existing client-factors that predict outcome (expectancy for symptom change and treatment credibility). However, CBT-mindedness was not associated with therapy session attendance. Results suggest that pre-treatment CBT-mindedness is a promising predictor of CBT outcome. Clinical implications for this predictor of CBT response are discussed. The online version of this article ( https://doi.org/10.1007/s10608-018-9977-7) contains supplementary material, which is available to authorized users. We would like to thank Professor Ron Rapee and Mr Alan Taylor for their support in this research. Thanks also to the therapists and research assistants who coordinated and ran sessions, and finally the clients who participated in the trial. This study was funded by Dr McLellan’s PhD scholarship (Australian Postgraduate Award) and funding from Macquarie University for the clinical trial (to Dr Peters, 2010, MQ Safety Nets Grant Scheme). Lauren F. McLellan, Lexine A. Stapinski and Lorna Peters declare that they have no conflicts of interest.